Book Now for 2019 Spring and Fall Bear hunts. Limited Tags! Welcome to Call of the North! We have owned and operated Call of the North for 38 years, which means you can count on us to provide the service we promise. It also means we have great experience with wild game hunting and fishing in the area– a direct correlation to the success of your trip. Your satisfaction with our facilities and service is our number one priority. We hope this is your first step towards an experience of a lifetime at our resort. We are positive that you will join the hundreds of other guests who have left our resort completely content with their experience and return year after year for more. We look forward to hearing from you! Because we only accept a minimal number of hunters, we do not attend the Sports Shows. This is for your advantage. We would love to meet and speak with you in person, but we would have to book three times as many hunters than we now accept, in order to cover the excessive expenses of attending the shows. “I have already booked for next year. This will be my sixth year hunting Black Bear at Call of the North. I have taken three bears, and since then have only been looking for the “monster” bear. The others have averaged around 300 lbs. more or less. I’ve also enjoy the great fishing that they offer. One of these days I plan on going for archery moose. 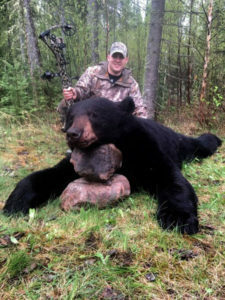 I see so many of them when I am bear hunting.” — Dan Franks — Poynette, Wisconsin. “My boys and I have gone to Call of the North four times in ten years. We have gone on three bear hunts there. This year we took three trophy black bears. We are all archery hunters and Joe knows exactly how to bait and set us up for a perfect archery hunt. We probably enjoy fishing just about as much as hunting because they have boats on all kinds of lakes. We’ve hunted across the U.S. and Alaska and have to say that Call of the North is exactly what you expect and more. We will be back.” — Sam Derugen — State College, Pennsylvania.